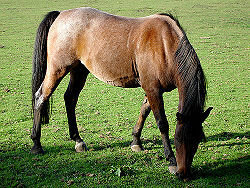 The horse is any of the species belonging to the taxonomic family Equidae. The horse family includes numerous extant species such as the donkeys (E. asinus), zebras (E. zebra), mules (E. mulus), and domestic horse (E. caballus), plus a number of extinct varieties only known from fossil records. This page was last modified on 5 December 2014, at 17:25.